BELIZE CITY, Wed. Dec. 9, 2015–Roughly 40 fishermen met today at the Fisheries Department compound in Belize City for a one-day workshop as fisheries authorities here in Belize prepare to embark on the full rollout of the managed access program—an initiative first piloted two years ago at Glovers Reef and Port Honduras which will put an imminent end to open access by licensed commercial fishermen to resources across Belize’s marine space. Fisheries Administrator Beverly Wade told Amandala that Cabinet had previously fixed June 2016 for the full rollout of the managed access program, but they have now green-lighted a soft rollout for next month, January 2016. She said that this would allow them to do a test-run and put in place institutional requirements for proper implementation. Wade explained that the soft rollout means that fisheries authorities will not be bringing down the force of the law, and they won’t necessarily be taking people to court for violating the new managed access rules. The first six months would, however, provide an opportunity for further public education and for building understanding of new requirements. It would also give fishers a greater opportunity to take on, their role and provide more valuable feedback to the Department. That was the kind of engagement that was seen in today’s discussion, which reached a high point this afternoon when fishers vocally raised concerns over age restrictions they face when they attempt to take young boys with them on the seas, in order to hand over the baton to them. This, they argued, is important in keeping them away from the pitfalls of a life of crime and violence. Fisheries personnel pointed to an apprenticeship program under which young people 15 and above can get permits to accompany commercial fishers, but some fishermen insist that this requirement is too stringent and blocks out youth who they want to begin learning the trade much younger—just as they did from their fathers. Another concern highlighted was piracy on the seas, and the dangers fishermen face when they are accosted with guns. One fisherman said that the fear of sea pirates is why he has stopped fishing at night, and he pleaded for interventions to improve safety at sea. A third concern raised was illegal fishing in southern Belize by persons from neighboring Honduras and Guatemala, but it was noted that with the institution of the managed access program at the Port Honduras Marine Reserve, and increased monitoring which has come as a result, those fishers have moved to other areas. The role of the managed access program in eliminating illegal fishers was one selling point advanced today for why the program needs to be rolled out nationally. However, there are concerns over how the program will really work for fishers, who have long enjoyed traditional fishing rights to fish in multiple areas. Fishers said that they would now be limited to fishing in two zones. The inclusion of fishermen on the community-managed access committees, 7 of which are now being formed, is intended to ensure that those who should rightfully get to fish in certain areas are not excluded, explained Nicanor Requeña, a member of a technical team of the managed access program, who emphasized the need for fishers to be intimately involved in the management and allocation of licenses for the managed access areas. Personnel from the Fisheries Department and partner organizations will also sit on those committees. 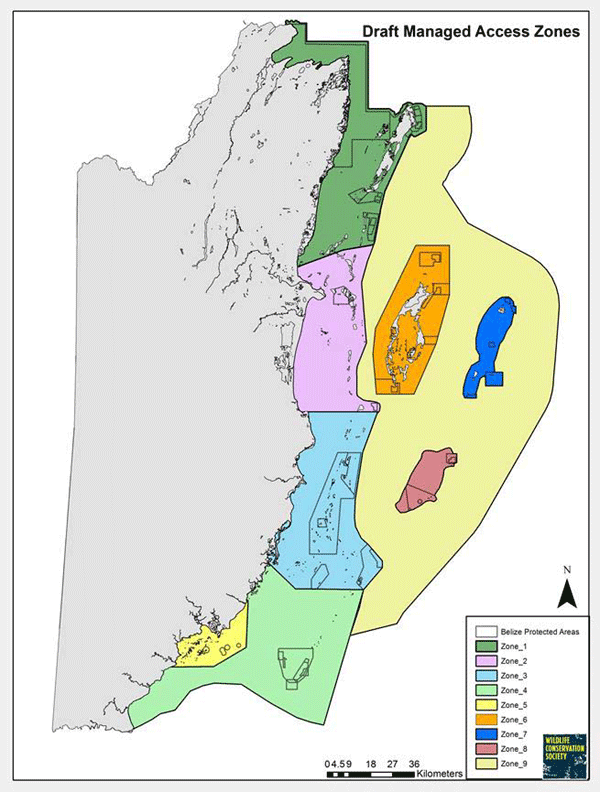 The program calls for 9 managed access areas, as pictured in the accompanying map, to cover all 15 major fishing communities, which fisheries authorities say reflects current patterns of fishing based on traditional use of resources, and reinforces Belizean sovereignty over the maritime region by establishing user rights for Belizean fishermen. Wade said that the Fisheries Department has been working with stakeholders for the past two and a half years to have a clear spatial understanding of where they are fishing and to work with fishers on the proposed map outlining the potential turf areas. Just under, 3,000 commercial fishermen are currently licensed in Belize, and most of them work in the central region, with the hotspots located from Gallows Point and down to South Water Caye, Wade informed. One key concern raised today by representatives of fishers is the preservation of their traditional fishing rights. She told us that they had thoroughly polled the fishing communities to find out who is fishing where. Whereas a license is not something individuals can sell, there is a provision for licenses to be transferred to next of kin or close family members, if someone exits the fishery, she said. However, if that does not happen, the license would revert to state hands, she added. In terms of addressing illegal fishing concerns, Wade said that the Fisheries Department is embarking on complementary initiatives, including a vessel monitoring system. “There is a lively discussion going on inside on safety and piracy,” she noted, adding that the new regime would help authorities to tackle problems in a more pragmatic way. The Conservation Drones which the Belize Fisheries Department implemented two years ago have been “a big help,” said Wade, but she noted that they are meant to be supported by other initiatives such as the vessel monitoring system and the SMART system, which helps fisheries personnel to identify hotspots more strategically and efficiently, given their limited resources. She said that the piloting of managed access at the first two sites has proved successful: “Hence the reason why we are moving to roll out the program,” she said. She said that fishers in those areas now play a more integral role in reporting and self-policing, since they have a greater sense of ownership. So, when the closed season ends for regulated species, they don’t rush to fish out everything during the first couple weeks in season. She reported a decrease in infractions in the two areas and better participation by the fishers themselves. Inland waters are excluded from the imminent managed access regime, but Wade told us that fisheries authorities have been talking at their strategic meetings, and they are all in full agreement on giving more attention and resources to create a regime for freshwater fisheries that would mirror what has been done for marine fisheries. The Fisheries Department is also working on decentralizing the issuance of fishing licenses. In 2013, Amandala reported on an initiative that would enable 6 government offices to offer licenses and permits online. 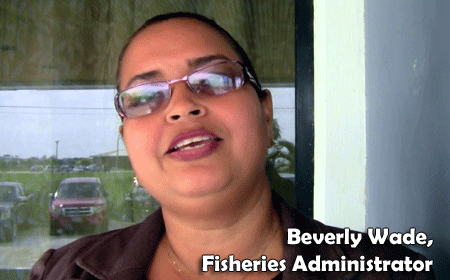 Among them, the Belize Fisheries Department was listed. Wade said today that they have been working closely with the Central Information Technology Office (CITO), which oversees the Taiwan-funded Belize National ICT Center in Belize, to launch the online licensing platform in 2017.